Rick Mercer’s visit to the Teaching Brewery was aired on CBC last night, and yours truly was a star, dahling. Yes, I was on camera for at least 8 seconds! And Rick chugged my Blackheart IBA straight from the bottle while I stood watching. Amazing. Alas, my agent failed to return my calls this morning, so it was back down the QEW in time for Promotion & Sales. We had a special guest: Phil Kerwin of Chimpanzee, a marketing and communications firm. Chimpanzee actually started in the Niagara region in 2003, but over the past decade, they have expanded to places as disparate as Sturgeon Falls (Northern Ontario), the UK, New York, and Serbia. They count among their clients Pimm’s, Archer’s, Guinness, Smirnoff (Black Ice) and Fielding Estate Winery. They were also the marketing agency chosen by Niagara College to brand and market the college beer when the Brewmaster program started up two years ago. Apparently they were given permission to go “edgy”–dangerous words for a marketing agency, and judging by some of the, uhhh…. interesting…. ideas Phil showed us, they certainly were skating close to the edge. However, what they didn’t realize is that the people who told them to go edgy were not the people who would be approving their ideas. In the end, all of the innuendo was replaced by the relatively tame “First Draft”, “Certified Originals” and “Brewmaster” series of college beers. We Brewmaster students can certainly commiserate with Phil–when we create our own beers in the Teaching Brewery, we also name them. However, when the beer hits the campus store, more than a few racy names and clever double entendres have been arbitrarily replaced with something a bit tamer. Even my own Vice Populi–which I thought was pretty innocuous—was renamed something fairly gormless. To avoid this problem at a professional level, Phil did suggest that a valuable strategy for a marketing team–and a great way to reduce wasted time and energy–would be to sit down with the actual decision-makers right from the start of the creative process and find out how far they want to push the envelope. In Brewery Management, it was all about planning a brewery expansion. This project can break a brewery into very small pieces if done wrong, or if done for the wrong reasons, so the first step is to establish a need for expansion. The most obvious one is sales demand–people want to buy more beer than you can make. There may be other reasons, though: lack of space in the brewery, equipment limitations, keeping up with the Joneses, customer demand for new styles, and a belief that future trends are pointing towards a need for greater production. Those are all good reasons on the surface, but before you start getting quotes on a new brewhouse, do a bit of cost-benefit analysis. This is going to be the biggest project since you opened the brewery, so make sure your reasons are long-term (more than 2-3 years). Remember that increased production may trigger higher taxes–how will that affect your bottom line? In addition, will all the ancillary equipment play nicely with your new equipment, or will you find yourself replacing steam and water lines, buying larger diameter hoses or replacing the brewery electrical? What about storage–do you have a place to keep all your new beer? Will you have to hire more people? Do you have the logistics in place to deliver all your new beer? Do you have proper quality control in place to make sure your new beer has shelf stability? Can your current ingredient suppliers keep up with your increased needs? Will the municipality be happy with the increased Biological Oxygen Demand (BOD) going down the drain? Mike Arnold raised an interesting strategy. You want to delay expansion for as long as possible due to the cost, so instead of simply increasing supply by expansion or contract brewing some of your beer elsewhere, why not try to dampen demand? If you have a popular beer that isn’t very profitable, and a much more profitable beer that sells less well, make more of the profitable beer at the expense of the cheaper beer–sales will drop off, but you will probably make as much or more money because of the higher profit margins. As a matter of fact, don’t expand because of demand for a cheap, low-profit beer–it will take too long to see any cost-benefit. Do expand because of demand for an expensive, high-profit beer. The bottom line seems to be: expand only if absolutely necessary, and only expand to your planned needs. 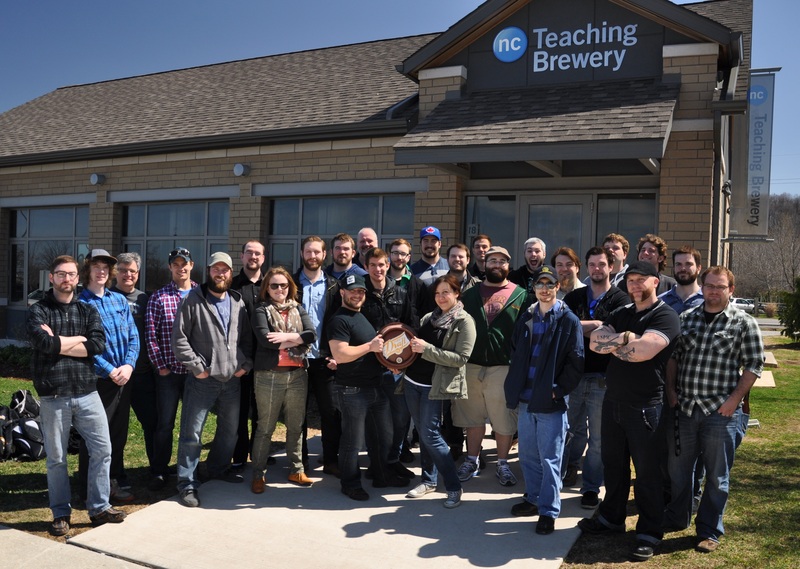 We spent most of Sales & Promotion making final plans for the Teaching Brewery tours at the college Open House this Saturday. Free beer. Free beer sausages. Free waffles (while they last). Come on down! In Brewery Management, Mike Arnold warned us about a fraud making the rounds of small brewers and wineries. Some guy phones up and wants to buy $3000 of beer for a family reunion. He uses his credit card to pay for it, then has a delivery truck come by and pick up the beer the same day. Anywhere from a few hours to a few days later, the brewery gets a call from VISA that the real owner of the credit card has just discovered it has been stolen. VISA cancels the transaction and the brewer is out $3000. Stealing a man’s identity is one thing. But stealing his beer? That’s beyond the pale. Mike went on to talk about a grab bag of stuff today, including what type of sales rep to hire, depending on where the majority of your sales are going to be. If all your beer is going to the LCBO, you need one kind of rep–probably wearing a suit and tie. If you’re selling to bars, you probably want someone young and hip. He also covered the basic types of insurance you need, and some others you might want, including basic commercial fire and theft, liability, key man, vehicle, liquor liability, employee practices, non-owned auto, indemnification for third parties, utility interruption, boiler & machinery, employee dishonesty, etc. Which brought up “when things go wrong”. Your brewery sells the Beer Store $250,000 worth of beer, you use the money to pay your bills, then you find out your beer has gone bad. A disgruntled employee deliberately opens the drains on all the fermenters. Someone sues you. The landlord decides your grain silo is attracting mice and arbitrarily removes your grain mill. A restaurant owing you $30,000 goes out of business. Look at the problem, look at solutions, draw up a plan, execute the plan. My current problem is that I am thirsty. I believe have a plan. …but first, a quick flashback to yesterday. Most of the Brewmaster students from both years ended their scholastic day participating in one of two True Colors workshops led by my wife Elaine. True Colors posits that there are four main personality “colours”; although each person is a mixture of all four, one or two colours will usually predominate, which then will inform how that person acts, learns and interacts with others. and the creative and caring (Blue). Learning what colours predominate in me should help me to understand what my motivations are, why I enjoy doing my own particular hobbies and work, and what approach I take in doing them. The reverse side of the coin is that some of my own actions are doubtless very irritating to people in other colour groups. This can help me in both personal relationships and in the workplace. By realizing what colour another person is, I can not only try to tailor my personal interactions with him or her to make myself less irritating, but as a manager, I can also try to communicate with that person and motivate him or her by reaching out to that person’s colour. For instance, in an interesting exercise, the least Orange people in our workshop tried to design a weekend getaway for an Orange person (the fun-loving risk-taker). The non-Orange people came up with the idea of sending the Orange person to Whistler ski resort for a weekend of snowboarding. However, to get there, the Orange person would be given a rental car at a random spot in Vancouver without a GPS or road map. If the Orange person could get to Whistler by a certain time by simply asking strangers for directions, he or she would receive a big cash prize. Needless to say, this pushed all the right buttons with the Orange people in the room–a competition, a prize, interacting with strangers, and snowboarding at Whistler to top it off. Woo-hoo! The non-Orange people knocked it out of the park. All in all, the workshop was a fun time, a lot of lauighter, and gave us some valuable personal insights to boot. Okay, fast forward to this morning, when we started with a quiz in Sales & Promotion, followed by a lecture on using social media. Of course, this raised the whole question of how to best use social media, which social media to concentrate on, how to know when to leave a particular medium behind when its time in the sun has faded, and when to join a medium that is about to rocket skywards. This is my own particular HIGHLY SIGNIFICANT ANALYSIS: There are no answers to these questions. Target your audience. Keep your ear to the ground. Do the best you can. On to Brewery Management. Mike Arnold warmed us up by bringing up recent legislation passed in New York State (the Farm Brewery Act, July 2012) that allows breweries and wineries to give out samples of and promote each other’s products. (That had previously been illegal.) Mike led a discussion of whether such a program in Ontario would help or harm craft brewers. On to the Big Topic of the Day: Critical Path Project Planning. Total sales for 2012 are not just the sales figures for December (which, yes, are only about 25% apart). 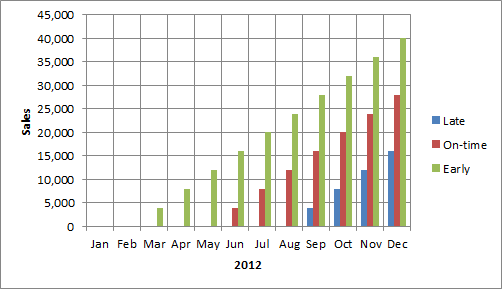 As this graph illustrates, total sales are the sum of every month’s sales in 2012. If the brewery started three months late, total sales for 2012 would only be $40,000 — 65% less than the brewery that started on time! If the brewery managed to start three months early, total sales would be $220,000 — almost double the amount earned by starting on time, and 4.5 times more than the brewery that was three months late. So, as Mike pointed out, starting on time (and even starting early, if possible) can have a huge impact on your bottom line–and on the survivability of your brewery. So critical path planning is essential. At the moment, the critical path — the shortest path through all of these activities — is 1hr 50min. However, it’s clear that some of these actvities could be done simultaneously if they were re-ordered. By moving coffee-making and listening to traffic reports out of the critical path, I have optimized a new critical path, shortening it to 1hr 25min. I can now afford to sleep 25 minutes longer and still get to class on time. Our next big project for Mike’s class is a complete critical path for a brewery start-up. Big project, better get started on that pronto. Equipment–what to look for and look out for, things to consider when purchasing, such as shipping time, compatibility of parts with current equipment, warranty, follow-up service, installation costs, references, electrical and pressure standards, and how the equipment will fit into your brewery. Taxation — pretty well a rehash of Jason’s Fisher’s class yesterday. Inventory control — how much did you have, how much did you use or sell, how much do you have now? Human resources — according to Mike, brewers always underestimate how many people they will need to get the brewery started. Production management — optimize equipment to maximize production, tie upcoming sales promotions to sales commitments. To end the day, we had a brief visit from Brian Egan and Shelly Tripp, respectively the Production Manager and HR Manager at Creemore Springs Brewery. Creemore Springs started as an independent craft brewery before being bought up by Molson in 2005. However, Shelley and Brian maintained that other than a mandated change from custom bottles to industry standard 341 mL bottles, Molson has alloweed Creemore Springs to do its own thing. It is undergoing a major expansion over the next 3-4 years, and doubtless they will be looking for qualified brewery workers. So a long day was somewhat mitigated by free swag. So we spent the entire class going over plans for the event. In Brewery Management, Mike Arnold used annualized data from The Beer Store to show us that macro beer from the Big Boys climbed during the summer time–as you would expect–with huge spikes marking the four summer long weekends, and another smaller spike at Christmas. Mike then shared sales data from his own brewery, Trafalgar, which showed that summer was actually kind of quiet, while the feast days–Easter, Thanksgiving, and especially Christmas, were the hot times of the year for him. We need to start thinking about sales patterns for our own breweries and how to anticipate when our beer will be selling well–and when it won’t. That being said, the brewery I worked at last summer was brewing and packaging beer flat out during the hot weather–no sign of a summer slowdown. Other students working at other breweries reported the same thing. It’s possible that Trafalgar’s summer sales dip is atypical for the craft brewing industry. Mike also brought up an intriguing idea–Canada is a pretty cold place in the winter, so why aren’t we using some of that free cold air to keep our beer cold, rather than heating up the inside of the entire brewery, then using glycol (and energy) to cool off the beer fridge? Mike also took us through the permits we will need from three levels of government in order to open a brewery. We have actually been through these in both Beer Industry and Sales & Promotion, but it was useful to get the information reinforced from another point of view. Then the biggie: A full 20-minute presentation to a panel of experts (Mike Arnold, Trafalgar Brewing; James McConnell, TD Bank; Ron Keefe, Granite Brewpub; Jason Ellesmere, Beau’s Brewing) presenting a business plan for an imaginary brewery, with full details of size, location, production, packaging, distribution, target demographic, marketing plans, competition, SWOT (Strengths, Weaknesses, Opportunities, Threats), start-up costs, how much equity investment we would need, and income statements for the first two years of operations. We had been arbitrarily split up into teams of seven for this project, but only two from each groups were allowed to enter the sanctum and make the presentation. And so it was, friends, that this poor scribe was chosen by his group to be thrown to the wolves… err… to be one of the lucky presenters. In reality, it was dead simple: just make your presentation for 20 minutes, then for another 10 minutes, get grilled on everything you had forgotten, glossed over or hoped the experts wouldn’t notice. No PowerPoint, no flipcharts, not even a smartphone app allowed. Aha, but handouts were admissible, so although we had already handed in a 6-page summary last week, my partner and I arrived armed with multiple copies of a 35-page business plan in full colour (with “twenty-seven eight-by-ten colour glossy pictures with circles and arrows and a paragraph on the back of each one”, as Arlo Guthrie used to sing in Alice’s Restaurant.) Even if we didn’t know what we were talking about, at least it looked like we knew what we were talking about. We survived with only a few scrapes and bruises. No time to rest though–the mid-term week storm continues to rage tomorrow in the Teaching Brewery, where I will be brewing for marks. For the prospective brewer, two very interesting classes today. In Promotion & Sales: setting up a retail store. First of all, what type of person should open a store? Well, you probably need a creative type who can envision what the store should look like–but you should also have a number cruncher who will delve into daily and monthly sales figures to see what is selling and what is not. In addition, you have to consider the three factors that make a customer come into your store: Assortment, Price and Best Experience. It’s impossible to excel at all three (at least for a mere mortal), so choose one, be excellent at it, and be very competitive at the other two. So if you offer the Best.Ever.Customer.Experience, complete with a free car wash and a mani-pedi just for coming into the store, you can probably afford to be merely competitive with price and assortment. On the other hand, having two dozen of everything in the universe in your store probably cuts you some slack with price and customer experience. Et cetera. Quality shoppers, usually older and fairly well-off, will pay more for quality products. They make up about 10% of the shopping population. Social shoppers look for the wonderful experience. They too will pay more if they find a store they enjoy. That’s another 10%. Specialty shoppers are intensely brand loyal, and don’t really like shopping. Quality and a good, efficient in-store experience are what they are after–they know what they want, so don’t get in their way while they get in and out quickly. 15% of shoppers are like this. Price-sensitive NON-shoppers are after moderate prices, hopefully in one place, since they don’t like to shop around. This is how Winners and Marshall’s stay in business, because a full 35% of shoppers fall in this category. Price sensitive shoppers are also price-driven but they like to shop. Malls are full of them, since they make up 30% of the shopping public. Next up: location. Downtown? Warehouse district? Tourist area? Suburban street? All have their advantages and disadvantages, but which work best for your business? Then you need to think about your in-store design, flow and displays, signage (be consistent and try to avoid hand-made signs drawn with Sharpies), lighting (fluourescent is cheaper but track incandescent is the most flexible and focusses on displays), use of wall space (it’s your most productive space in terms of sales per square foot). Hint: Hire a professional designer to help. Look for one that talks in terms of better sales and productivity relevant to your target market, not just store design. Once you have your store in place, better have some sophisticated Point of Sale (POS) software that can track your daily and monthly sales, right down to item size. First, its easier to know when to restock when inventory gets low. Second, good POS software will allow you to figure out what parts of your store are working, in terms of sales, and which parts aren’t. This will allow you to adjust displays, put lesser-selling merchandise on sale, and generally let you know if your store design is working. Finally, are you providing an excellent overall store experience? A recent Harvard Business School study found that a customer with a low to moderate shopping experience only had a 20% chance of returning to the store. A customer with a moderately good experience would return 50% of the time. And a customer with a very good to excellent experience would return 90% of the time. Okay, I wasn’t shocked to hear that a better experience equates to a better return rate. What was surprising was that even a moderately good experience only resulted in a 50% return rate. You need to provide an excellent experience just to have a better than even chance of seeing the customer again. Huh. In Brewery Management, Mike Arnold warmed us up by discussing how the industry defines a craft brewer. This is a a constantly changing target, and the various definitions that have been used (amount of beer, use of corn adjuncts, controlling interest by larger corporation, styles brewed, etc.) always leaves somebody’s nose out of joint. On to the main topic of the day, starting up a brewery. First, set up a company structure, set up a bank account, order equipment, get your permits, get quotes on insurance and start planning production. Whoa, let’s back up a bit. Each of these is going to take some time over the next few weeks. Okay, Step 1: Company structure. Sole proprietership is the easiest: you own the whole company, you get all the profits. Yay! Problem is, you are also liable if the company goes bust. The bank will come looking for your house, your car, your clothes and your little dog too. Same thing if you get sued. You are personally liable. A simple partnership works much the same way, except now there are two of you to share the liability. The bank gets two homes. And two little dogs. The only way to avoid financial liability is to incorporate. That simply means formally registering your company with the Ministry of Government Services. Of course, you have to structure your company a certain way to meet the legal requirements for company governance: shareholders, Board of Directors, and company officers (the Head Brewer, CEO, CFO, etc.) The shareholders provide the equity, and they elect a board of directors to oversee the strategic vision of the company. The board of directors in turn hires (and fires) the company officers, decides what firm or person will audit the company books and approves the salaries and expense accounts of the company officers. The company officers make the day-to-day decisions about running the company. At least once a year, the shareholders have a meeting where they can retain or replace the board of directors. There are some added extras of course. Shareholder voting. Minority shareholder rights. What happens to a person’s shares if he or she dies? Selling your shares. Shotgun clauses if there is a falling out between shareholders. (A shotgun clause is kind of a neat “prenuptial agreement” between shareholders. In the case of a falling out between partners, the clause forces a partner to make a fair offer for the other partner’s shares or risk losing money. Suppose Cain and Abel buy a sheep worth 50 shekels by each putting up half the cost, 25 shekels. After a few months, the two partners are not getting along. Cain decides to buy Abel’s share so he can own the entire sheep. Knowing that Abel needs the cash and will probably accept a lowball offer, he craftily offers Abel only 20 shekels for Abel’s share of the sheep. “Aha!” Abel thunders, as he hauls out the roll of papyrus holding their partnership contract. “We have a shotgun clause.” It turns out that if Abel turns down the offer to buy, he himself must then buy Cain’s share of the sheep at the offered price. Cain mutters darkly as he thinks murderous thoughts about his brother as Abel buys Cain’s share of the sheep for only 20 shekels, 5 shekels below market value. The way to incorporate is actually pretty simple. First do a name search (or have someone do a name search) on your proposed corporation name. It has to be unique. If you don’t want to think up a unique name, get a number for your corporation. (You can always call the operating company whatever you want, it’s just the corporation name that has to be unique.) Generally a name search will cost around $60. Then there’s an incorporation form to fill in. You can get a lawyer to fill it out for around $1000, or you can fill it out for free. The government wants details like the number of directors who will sit on the board (Fixed number of directors? Or a variable number between 2-6? ), who the founding directors will be (at least until the first shareholders’ meeting), any restrictions on who can be a shareholder (for instance, perhaps you have to be an employee to be a shareholder), the number and type of shares (common, preferred, non-voting, etc. ), conditions for transfer of shares, who are the incorporators, etc. Take the form and $400 and skip down to a Ministry of Government Services office, take a number, stand in line, have a government drone look over your paperwork. Done. Two weeks later, an form called an Initial Notice arrives. Who sits on your board of directors? And other exciting details. Fill it out, send it in. (Send in a new one everytime there is a change to the board of directors.) You’ll also get a box of incorporation papers and an embossing stamp so you can sign and seal legal dcouments with your corporation stamp. Cool, if that’s the way you roll. Next week, we’ll take a break from planning our brewery in order to make a presentation of a business plan for a proposed brewery before a panel of real experts–a real banker and three real brewery owners.